Imagine the following situation: You wake up one morning and there are bulldozers standing in front of your house. Armed police units enter your home and take away your electronics and valuables. You are pulled violently out of your house and the bulldozers begin their destructive work. You are now homeless and there is no government agency interested in you or your future. Game over! A few weeks ago, Lars Bauer and Jens Berger from the NachDenkSeiten were invited to Cambodia by Welthungerhilfe and have made themselves a picture of the causes and effects of land grabbing. This article describes the background and attempts to show perspectives. 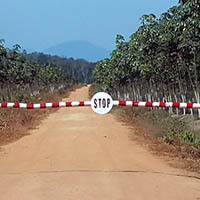 The research results from the field are processed in the video report ‘Land grabbing in Cambodia’. At the end of the text you can find a number of links for further information. Things that sound unbelievable to German ears are sad everyday life in Cambodia. One of the reasons why there are currently huge land conflicts in Cambodia lies in the recent history of the country. After French colonial rule Cambodia evolved into a politically stable country, acting neutrally in the big game of the super powers. This was, however, a thorn in the USA`s side, who expanded their war in Vietnam in the late 1960s bit by bit to neighboring countries. In 1970 a military coup supported by the Americans finally implicated the country in the Vietnam War. This led to the instigation of a civil war by a – at least on paper – communist guerilla group called Khmer Rouge which was supported by North Vietnam and which in the end won the war in 1975. Under Pol Pot, the Khmer Rouge led a terror regime unique in history. Within a few years, around two million people had been killed – sometimes just because they wore glasses, identifying them as a ‘bourgeois’ traitor and therefore as an enemy of the state. The Khmer Rouge wanted to turn Cambodia into a ‘primitive communist’ farmer state, where cities – like many other things – were considered as counter-revolutionary and had to be disposed. Shortly after the power seizure by the Khmer Rouge, there were only 20,000 people living in Phnom Penh, keeping cows and pigs among the ruins of a city, which previously had millions of residents. This even went too far for the now-reunited communist Vietnam, which then invaded Cambodia and occupied the country. The ensuing civil war ended not till 1991 as a result of a ceasefire and it took more than ten more years before the country gained a stable government. All this had a huge impact on the land issue. Under the Khmer Rouge all private property was classed as ‘bourgeois’, all deeds, contracts and land register entries were destroyed. And also the successors from the communist Vietnam had no interests in looking after the private ownership structures of the occupied country anymore. 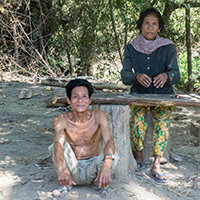 In addition, as a result of a decades war, displacements and flights, only a few Cambodians still lived on the piece of land that their families had cultivated for generations. What can be described, with proper understatement, as ‘a lack of legal security’ turned out to be a real stroke of luck for corrupt kleptocrats and foreign companies. Because, when there are no recognised ownership deeds, people can be relatively easily expelled. Already in the time of the civil war illegally felled tropical timber was one of the most important income sources for all warring parties. 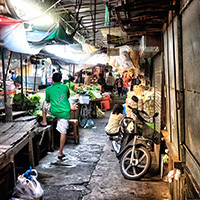 This was predominantly accelerated by the economic liberalization of Vietnam, which shortly after China had been pursued the path of state capitalism in 1986. There arose a paradise for a new, highly corrupt clique made up of party officials, who very quickly ‘delighted’ their own country and the bordering states of Cambodia and Laos with new business opportunities. The uncontrolled felling and export of tropical timber proved to be particularly lucrative. Across the families of the top party officials in Cambodia an extremely efficient ‘timber mafia’ developed – the timber barons. In 1990 73% of the country was still covered by forest, today is only 57% left. The export of high-yield tropical timber was carried out mostly via newly-founded Vietnamese companies. A significant part of the profits, however, went to the corrupt elite of Cambodia who granted the concessions on-site and organized the dirty work. This was also the starting point for the so-called land concessions, what is still the official term for land grabbing. 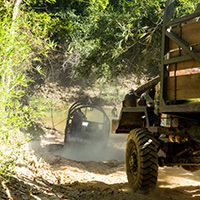 After the most lucrative tropical wood reservations had been chopped down and the market reduced due to a rigorous import ban by the EU and the USA for non-certified wood, the timber barons sought a new and equally high-yield field of activity. The timber barons became rubber barons. Natural rubber is now cultivated on large areas, that – like the tropical timber – arrives on the world market mostly via Vietnam. With regard to the business model, not much has changed. Corrupt Cambodian officials grant the necessary concessions to agricultural companies and the people who live on the affected land are mostly displaced with crude methods. The majority of the agricultural companies that benefit from land concessions are national companies, which are directly or indirectly owned by members of the top party elite or their relatives. The well-known Vietnamese enterprises come a close second and far behind are the companies from China, Malaysia and Thailand. In order to conduct business in the area, on the one hand comparatively small fees to the state and on the other hand comparatively high bribes to a lot of officials are necessary. One of the reasons why the issue of ‘land grabbing’ does not enjoy a high significance in Germany, even among critical members of the population, is certainly the fact that it does not fit into our learned perpetrator-victim scheme. As it is shown in the case of Cambodia, the perpetrators do not necessarily belong to the circle of the ‘usual suspects’. The responsible enterprises are not called Goldman Sachs or Monsanto, but Hoang Anh Gia Lai Group (HAGL) or Vietnam Rubber Group (VRG) – the latter is actually a state concern. In most cases perpetrators and victims have the same nationality or at least come from the same region. The North, however, is still excellent in business in a different area. Every enterprise requires capital for its investments – and the same applies for land grabbing. Who is financing the Cambodian and Vietnamese agricultural companies? Late one of the financiers of the HAGL group was the Deutsche Bank, so that as a result the subject of ‘land grabbing’ did at least receive a single headline in the main German media. Afterwards Deutsche Bank publicly separated from HAGL – at least officially. The question of who finances the ‘land grabbing firms’ cannot be answered due to the impenetrable thicket of holdings, offshore companies and ghost companies. No-one would publicly admit to being involved in such businesses. But there are apparently still plenty of deals. It is well-known that the demand for profitable investments, which may also be ethically objectionable, is bigger than ever. On paper Cambodia is a parliamentary monarchy. In reality, however, the Cambodian People’s Party (CPP) controls all the important positions in the country. Cambodia is ruled by a functionary elite – a “deep state”, a state within a state, which comprises a conspirative complexity of politics, military, judiciary, administration and economy. Although corruption, kleptocracy and human rights violations are ubiquitous, the population now has fallen into a rigid of acquiescence. The reason for it is primarily of a historical nature. After decades of civil war, the Khmer Rouge genocide and the Vietnamese occupation, the Cambodians have an understandable desire for stability. When there is a choice between freedom and stability, stability wins out. However, this is changing. Particularly the younger generation is no longer willing to accept the overarching exploitation. In order to alleviate the land conflicts in Cambodia, it is indispensable that Cambodian politics takes seriously the concerns and needs of its population and ensures that the existing laws are actually applied. Is it absolutely understandable that a developing country wants to gain revenues from the export of its agricultural goods and raw materials to support the development of the country. This is, however, not the case if the profits are pocketed solely by a small elite and spent on expensive consumer goods. Without pressure the Cambodian politics will not allow its most lucrative income source to run dry. This pressure can partly come from outside. Every year Cambodia receives more than one billion dollars as development aid from states in the North and from international organizations. Again and again the donor countries call on the Cambodian government to pay attention to human rights and to provide greater transparency. The subject of land grabbing is also addressed continually within this context. However, almost nothing has happened. Cambodia passes laws and directives that its own agencies do not adhere to. The donor countries grumpily take note of this, present new demands and increase the development aid year by year. This of course is in spades implausible and will not impress the country’s corrupt elite. Within this context from time to time the argument comes up that, if the North takes a step back, China is ready and we should not let the last lever we have about a country like Cambodia disappear airy. This is a good point. But what sense does a lever make, if you are not willing to use it anyway and everyone knows that? Much more important to the North, meanwhile, seem to be the economic relationships. Above all, fast-growing Vietnam is on the top of the wish list of German companies. So it is no wonder, when Chancellor Angela Merkel prefers to “fill the partnership with life”, rather than discuss the land grabbing activities of Vietnamese companies in South-East Asia. How does German foreign policy actually differ from the Chinese? For Germany too, it is primarily about economic interests. Compared to that, Cambodians, whose houses have been destroyed by bulldozers, are no big concern to German politics. In any case, it is difficult to say whether there is actually any lever at an economic level. In the trade of tropical timber, the EU and the USA have – albeit too late – managed to implement certification which ensures that, without a great deal of criminal energy, it is very difficult to export illegally felled timber to the EU and the USA. In the case of rubber, however, it is not that simple. 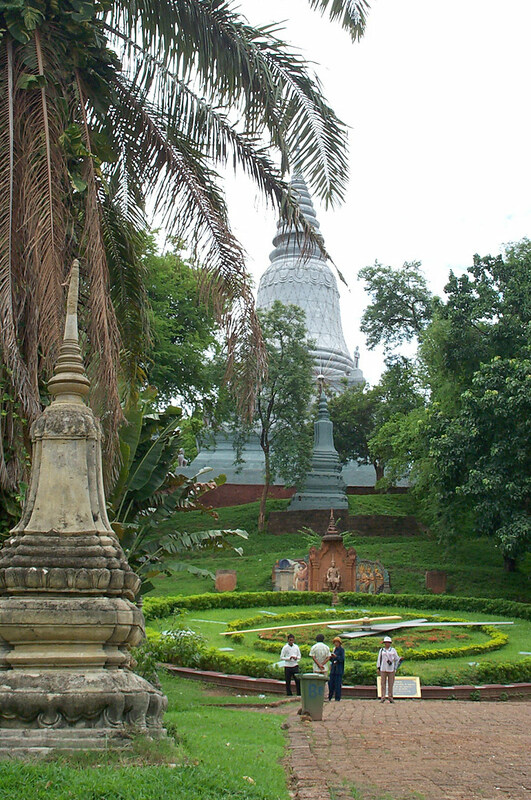 Officially China, South Korea, Malaysia and Vietnam are the biggest customers for Cambodian rubber. EU and USA trade regulations would – even if volitional – deflagrate at this point. It is a little different in the case of sugar cane – which is behind rubber, the second biggest agricultural product cultivated on the area of the land concessions. The so-called ‘Everything but Arms’ agreement permits 49 developing countries to export their goods duty-free into the EU. This regulation, which was doubtlessly well-meant, has led to an increase in the granting of land concessions for sugar cultivation. A directive for helping developing countries has become a trigger for land grabbing. Paradoxically, enterprises which are involved in land grabbing activities are not sanctioned by the trade policies of the EU, but actually subsidized. This shows how complex the conflict situation is and how difficult it is to issue sensible directives and laws that can actually help local people. Much more promising is the area of development aid. 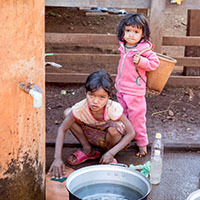 NGOs, such as the German Welthungerhilfe, help people to help themselves by supporting both those who are affected and those who are not yet affected. This concrete approach is definitely more useful than abstract debates about foreign and economic policy initiatives, which are neither politically realizable in Germany nor in the rest of Europe or the USA, as they are contrary to the interests of big companies. Unfortunately in the short term the suffering of the population will not change a lot. In the medium to long-term, improvement can only be expected through continuously increasing pressure from inside the society. Therefor local civil society must be strengthened. This is probably also the best path for modern development aid. As the German saying goes, hope is the last to die. More pictures of our trip to cambodia are available here.